I’m 5,000 feet up in the Julian Alps, facing my fear of heights head on. I’m gliding down a snow-capped mountain with all the grace of a gazelle. I have snow-ploughed for the very first time and I didn’t even fall on my face. As I’m about to fist-pump to my own incredible achievement, a two-year-old whizzes past me and snow-ploughs on their own. I put my fist-pumping hand back in my pocket. It gives me some comfort but little confidence for the next three days - which will be spent traversing this Eastern European country’s magnificent mountains. In 72 hours, I will have travelled to three different snow sports destinations in what I come to proclaim as Europe’s hidden ski destination, and tried both cross-country and traditional skiing. And I only fell four times, so I’m taking that as a win. I don’t know much about Slovenia, aside from the fact that Melania Trump emigrated from this small region to the United States, where she would eventually meet Donald Trump and become First Lady. Before I go, I’m told that there will be billboards with her face on them everywhere, praising her success; so imagine my disappointment when I arrive and there are no billboards. No ‘We love Melania t-shirts’. In fact, no one even mentions her name. With my one preconceived notion out the window, I walk around with my eyes wide open, keen to soak up as much of this country as possible. It’s rare you visit somewhere you know virtually nothing about and I had very little time research before the trip commenced. But it turns out Slovenia’s wine region is famous. Who needs Tuscany when you have Vipava Vallery? 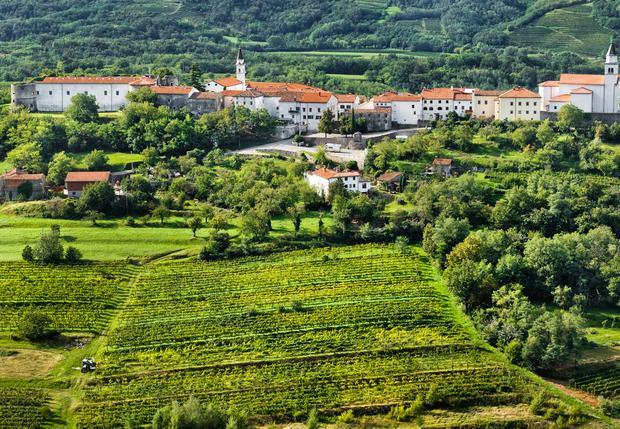 The home of Slovenian wine country, this picturesque setting makes for second-to-none views and is a growing destination for weddings. The wine-rich valley stretches from Nova Gorica to Karst and is home to some of the most delicious selections of wines I’ve tasted (bonus: the wine is of such high quality you don’t get hangovers, a claim I put to the test many times during my trip). It’s becoming an increasingly popular destination for weddings, as couples can get those postcard-perfect pictures from your big day nestled in the foothills of the Slovene Littoral. In the name of journalism, I try a number of different Slovenian wines over the course of five days paired with their unique cuisines. Be warned, if you are a fussy eater or a vegan, you may struggle to find something to satisfy your appetite, and the food can be a little out-there for some. I struggled at times to find the perfect dish, but sometimes it’s important to force yourself out of your comfort zone. Menus are custom-built for carnivores like myself - steak tartare at Rizibizi Restaurant in Portoroz, chicken drumsticks at Ročnjek Tourist Farm (FYI this all-natural spot doesn’t give diners menus – you’re served what is fresh) or the rib-eye at As Aperitivo Restaurant in Ljubljana. If you’re feeling particularly brave – there are the donkey meatballs at Istrian Tapas and the bear cheek at Pri Lojzetu, Zemono Mansion, a restaurant worthy of a Michelin star and often considered one of, if not the best, in the country. Slovenia’s appeal isn’t limited to mealtime though; it’s steeped in history, with one of the most popular tourist destinations being Predjama Castle (above) and the nearby Postojna Cave. 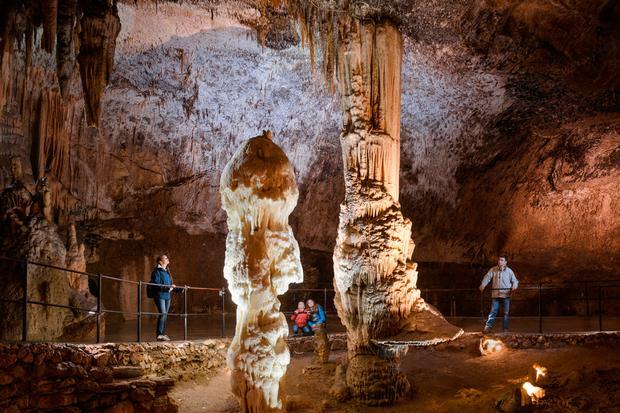 If you have a bucket list, add Postojna Cave to it. Entering this six million-year-old cavernous maze is like exploring a real-life Middle Earth. I was floored. I spent three-hour tour with my mouth agape and contemplating a side career as a “caver”, which is exactly what it sounds like. The interior has been pedestrianised as it’s one of the most popular tourist spots in the country, with anti-slip terrain, a mini-train and it’s wheelchair friendly. And for my fellow nerds, Game of Thrones author George R.R. Martin has visited and is said to have taken some inspiration for his next novel (package deals are available for Predjama Castle and Postojna Cave -be sure to get at least one picture in this storybook setting). Let’s just say my Slovenian isn’t what it used to be, so the fact that many residents speak fluent English certainly helps. It means jokes aren’t lost in translation and anecdotes have the same impact. My favourite story was from a tour guide showing us around my new favourite caves, who summed up this country’s unique history in the aftermath of world wars, cold wars and the fall of Yugoslavia. This man, of middle age, said his children are from Slovenia, he from Yugoslavia; his parents from Austria and his grandparents from Italy – all this, despite the fact that the family has lived in the same village for generations. Around every corner in this enchanting province is a new tale and something new to learn. In addition to the dramatic surroundings that follow us throughout our travels, there is the bustling capital city of Ljubljana (if you can pronounce that on the first try, I give you a gold star), which maintains all the charm of a well preserved medieval town dichotomised with the modernisation of an increasingly popular tourist destination. The five star Hotel GH Union is hosting diplomats the night of our arrival. Ljubljana Castle hosts the popular Restavracija Strelec and during walking tours, you can explore the cobbled streets by foot where you will see a seemingly endless array of bustling bars and restaurants. 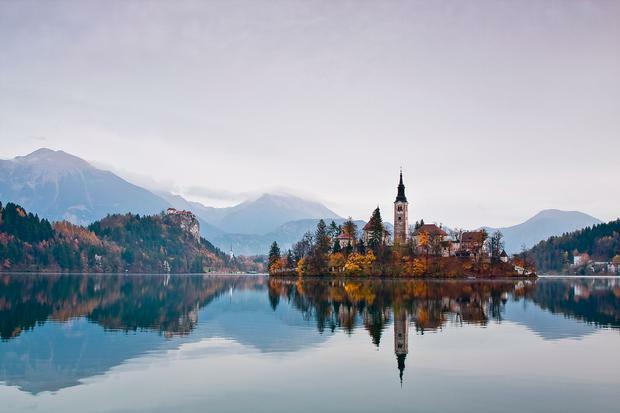 But the true jewel in the crown of Slovenia is Lake Bled. 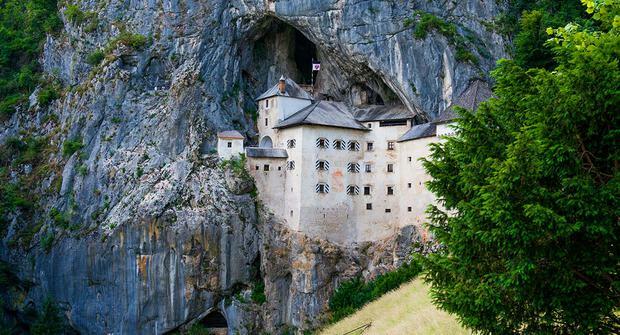 If you thought Predjama Castle was the inspiration behind Disney World’s iconic castle, then prepare to be dazzled by this impossibly pretty sight. Surrounding the sapphire blue water is a medieval castle and in the middle of the lake is The Church of The Assumption, which you travel to by pletna, a traditional rowing boat. But be warned, if you’re thinking of exchanging vows here, tradition must be adhered to and a groom is expected to carry their bride up the 99 steps. And they’re steep. When you’re in the area, try some of the famous cream cake which is sold across the region. 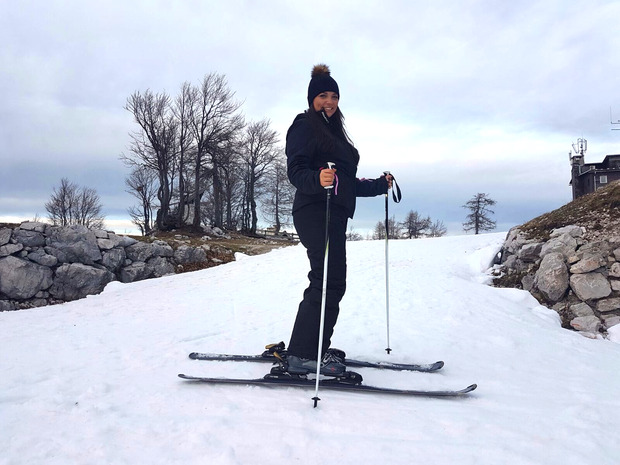 Although I came to Slovenia to eat, drink and be merry in general, there was one thing I was focused on experiencing – skiing. As a ski novice with a fear of heights who is prone to altitude sickness, I knew I wasn’t going to have an Eddie the Eagle moments soaring through the skies. But as we made our way on the gondola to take on our first day of skiing, I was pleasantly surprised that at more than 5,000 feet, I was able to enjoy the panoramic views of the snow-capped mountains with ease. The movies are right – the fresh mountain air really is good for the soul. 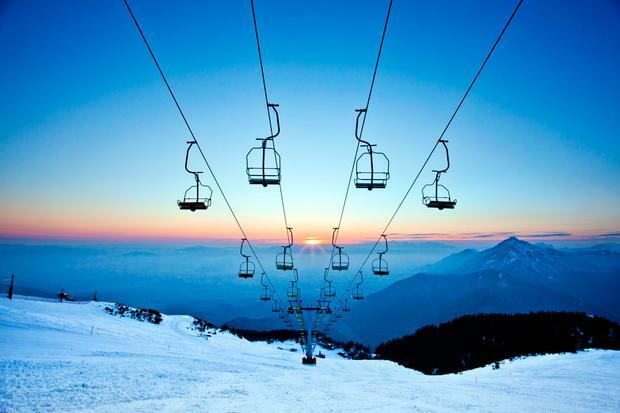 So, we take to the slopes. And by slopes, I mean a modest ramp in the beginners’ area where we learn to control our speed and stop. Within five minutes, one of my companions has already fallen over. I lag behind the group, refusing to go faster than a tortoise. One of the others has taken to it like a duck to water. After four hours of skiing, I feel stronger and more competent. I’m still petrified, but Blas, our ski instructor, has the patience of a saint and has a surprising amount of optimism when it comes to my potential on the piste. But cross country skiing is where I shine. The flat plain means my fear of heights is sufficiently at bay and my sense of balance bodes well for this strength-built exercise. Granted, I look ridiculous side-stepping in skis, but it’s something I would pursue to keep me in good physical shape and getting my ready for my next visit to Kranjska Gora. Ryanair (ryanair.com) flies from Dublin to Venice Treviso, located an hour away from Slovenia, from €24.99 each-way. You can enjoy the rolling hills of the wine country en route to your destination. Alternatively, you can fly via London Gatwick to the capital Ljubljana with and EasyJet from €30 and Ryanair to Dublin from €14.99. Hotel Jama: A newly renovated four-star hotel in Postojna Cave. Prices average from €95-€125 per night per room. Hotel Eco Bohinj: A plush property in the surrounds of Triglav National Park. Prices start at €125 per night. Hotel Slovenija: A five-star hotel near Piran. Prices start at €240 per room for a double room with a sea view. Grand Hotel Union: A historic hotel in the centre of the Ljubljana within walking distance of the train and bus station. Rooms start at €125.